Well it’s been a bit of time hasn’t!? Never fear, I have been trying new recipes and this one is a MUST for every headbanger, baker, stay-at-home-parent, or human being (except for those gluten-free types…sorry). 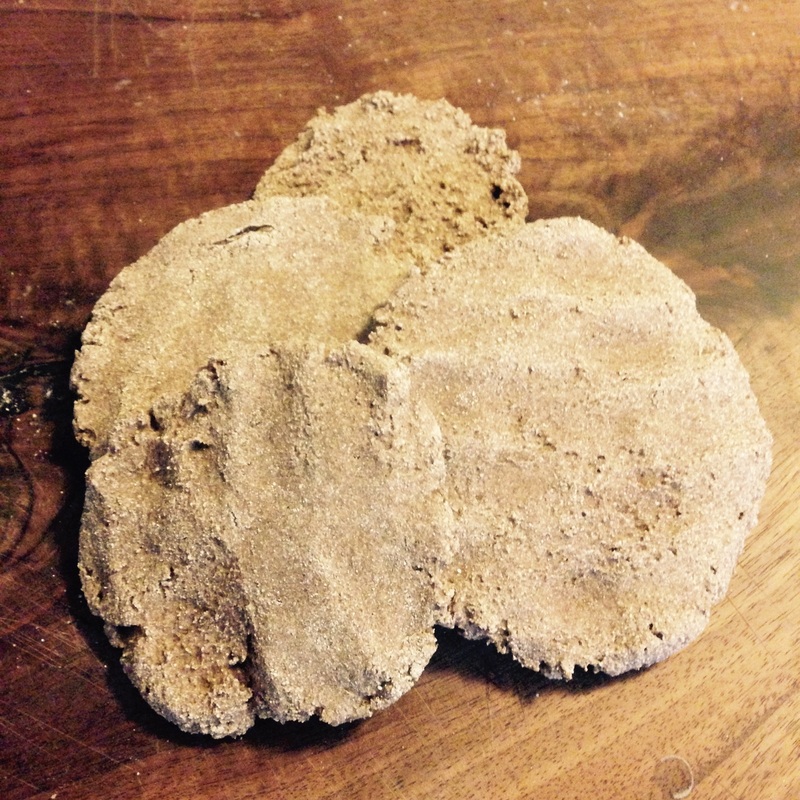 Barley Flour has a nice nutty / earthy flavor to it and definitely stands out compared to say Wheat or Rye flour. This recipe allows for that flavor to shine because the flour is one of three ingredients. Yes…only three ingredients for these little flatbreads. Before you gather your tools and ingredients, it’s time to select some suitable music. 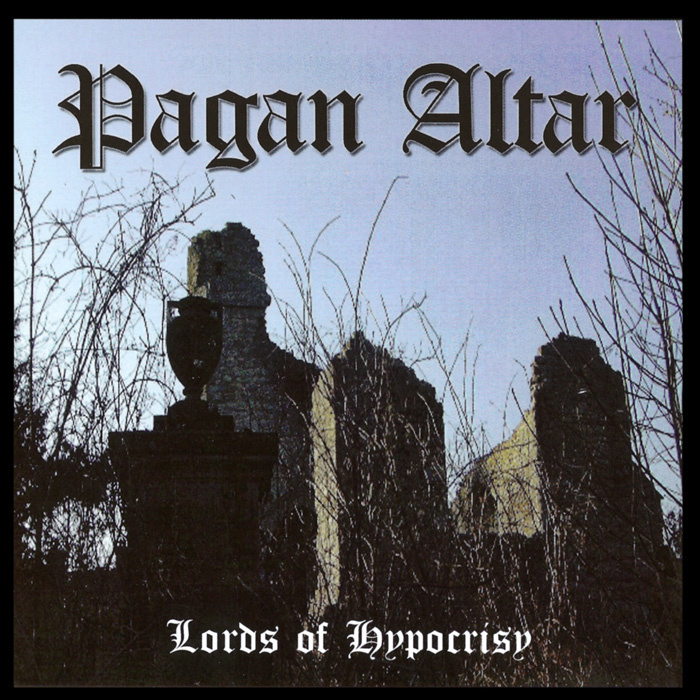 Being that Barley was commonly consumed by peasants in Medieval Europe, Pagan Altar is a very fitting sound and feel for this! Put on, Lords of Hypocrisy and you will hear what I mean. Set your oven to 475ºF. Pour the flour into the bowl and mix the salt in very well. Add the cold water and mix quickly and thoroughly until you have a firm and sticky dough. From this dough, divide it into four pieces and roll them into balls. Place them on your baking sheet and flatten them to about 1/4″ thick. You can make them round, square, or whatever shape suits your fancy. Once your oven is ready, place them in the oven for 15 minutes. Yes, this is “fast” food! Once the 15 minutes is up they should be nice and brown, but you may need to have them in for longer or shorter. So in just about 20 minutes, you’ll have some great flatbreads that go perfect with breakfast, lunch, or dinner. Top them with butter, jam, cheese, meat….you see where I’m going with this. Enjoy them day or night and eat them while you see the dead marching!! That would leave such a lasting tribute to their lives. But they never look down in the undergrowth at the pile of broken stone. 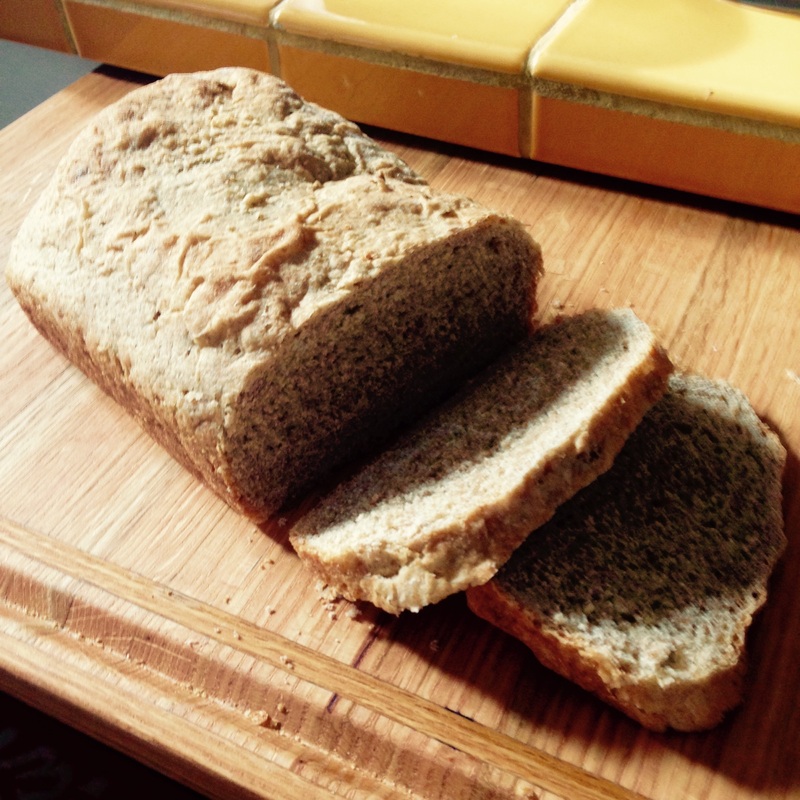 This recipe is for a part whole wheat part rye part white flour bread. That may seem like a lot of parts, but like a well written song, this bread is well structured. You’re going to be making two doughs and then combining them into one. It’s pretty easy. 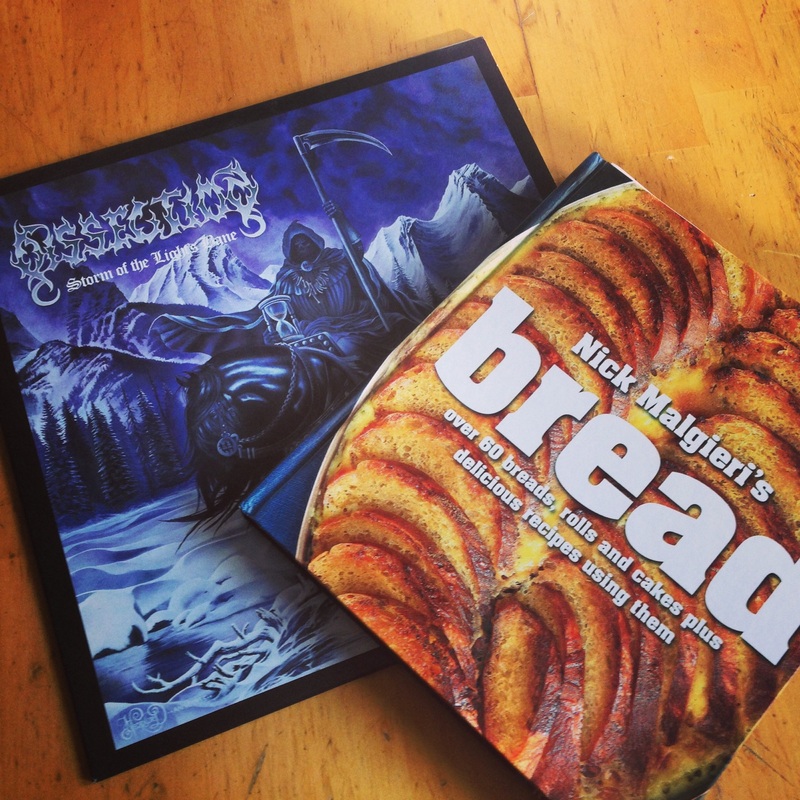 Dissection’s, “Storm of The Light’s Bane” and Nick Malgieri’s, “Bread” are what put this loaf together for me. It cannot be stated enough the importance of Dissection on extreme music. Adding everything from pure melodies, angel ripping riffs, and some of the best lyrics around, Dissection are a force to be reckoned with. Check them out here. As for the bread guy, he’s the author of over ten cookbooks and according to the back of the book, he is currently the director of the baking program at the Institute of Culinary Education in NYC. Visit him online at www.nickmalgieri.com. First thing you are going to want to do is get both of the doughs ready. Mix the first dough’s ingredients all together in one bowl. You will get a rough dough and it won’t look like much. In fact, it will be a bit difficult to mix after about 10 minutes of stirring, but that’s just the way it is. Once the dough is all together and well mixed, take some plastic wrap and cover the top of the bowl. Now do the same with the second dough. Cover this too with plastic wrap. Let both breads proof for about an hour. Take this hour to either start your Dissection album over again or put on The Somberlain (their first). More death metal than Storm…the heaviness adds to the bread. Trust me. After the hour is up, remove the plastic wrap from each bowl and take the second dough and place it into the first dough bowl. Here is where you mix them together! Using some good forearm strength, mix the two doughs together until they are well mixed. This took me about ten minutes of solid mixing. Once the doughs are well mixed, place some plastic wrap over the bowl and let proof for 30 minutes. Once the second round of your bread resting is done, flour a nice flat work surface and scrape out the dough and begin to knead it. Folding the sides in, inverting, repeating…do this for about 5-8 minutes and then return it to your bowl. Cover and let it rest for about 45 minutes. Tired of waiting yet? You shouldn’t be. Think of all the things that can be done while your bread is rising! Read some liner notes, practice air guitar, practice real guitar, read a book, do a puzzle, call your friends, etc. After the 45 minutes is up, take the loaf and scrape it back out onto your floured work surface. Don’t deflate it too much. You’ll need that air. Make the dough into a square and then fold it and roll it so it will fit in your bread pan. Remember before you put it in your pan, to grease your pan! Once it is ready, place the dough in it. Cover with plastic wrap again and let proof until it reaches the top of the pan. This took about 30 minutes in my house with average room temperature. Once it reaches the top of the pan, turn your oven onto bake at 400 ºF. When your oven is pre-heated, take the plastic wrap off of your bread pan and place it into your oven. Immediately reduce the temperature to 375 ºF and bake for 35 minutes (or so). Your bread should be a nice golden brown and a toothpick should come out pretty clean after doing the toothpick test. And BAM! You have yourself a healthy wholesome bread to use for sandwiches, snacks, or whatever else you can think of with bread. The mixture of wheat and rye make a really sweet tasting bread. Not overpowering in any format and just a great simple bread. This recipe is super versatile. Your first dough (the wheat dough) can be a mixture of just about any flour. Please share with me your experience(s) with this recipe, or if you have your own to share, please comment below or email me at: breadfiredeath@gmail.com and I will post it up! Was it the wind that brought back their cries? What you see before you is the beginning of a project I have thought about for ages (ok, a few years). I, Justin Kaye, am a rabid Metalhead who also happens to be an avid Baker. I have been called, “The Convexicutioner”, the “Martha Stewart of Metal” and a, “Defender of the Rye.” While I do enjoy these titles, I really just want to spread the knowledge, joy, and overall awesomeness that is baking. From breads, to cakes, to cookies…and hopefully a lot of things in between, I will be sharing with you all easy to follow recipes. Now, what is the connection? Metal is fast, heavy, slow, aggressive, melancholic, satanic, evil, dark, light…you get it (and you should KNOW IT…Dio is watching). Baking is all of these things as well. Kneading bread is like a heavy riff forming before you. Whisking together sugar and butter is a blast beat waiting to happen. And we cannot forget FIRE. Heat causes numerous ingredients to meld together and form a delicious concoction. I, Justin Kaye, the Defender of the Rye, hereby invite you to experiment with your oven. Join my Metal-Baking revolution.